Ashlyn and Joe said “I do” at the a Tuscaloosa River Market in Tuscaloosa, Alabama. 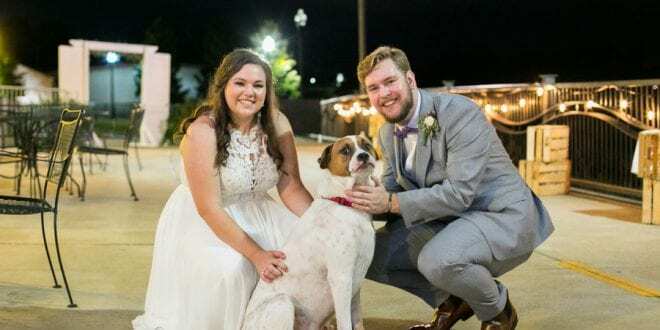 They shared first looks on the riverfront pier before heading inside for their ceremony where the aisle was lined with signs quoting the Corinthians and their adorable dog, Carson was there to share in the love. 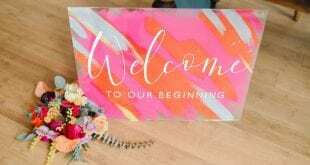 Their wedding altar was overflowing with lush pink and purple florals and above it, their names were projected onto a large screen. 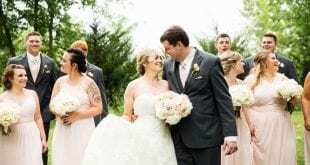 After their first kiss as husband and wife, Ashlyn and Joe posed for outdoor portraits with their wedding party while inside, the space was reset for the reception. 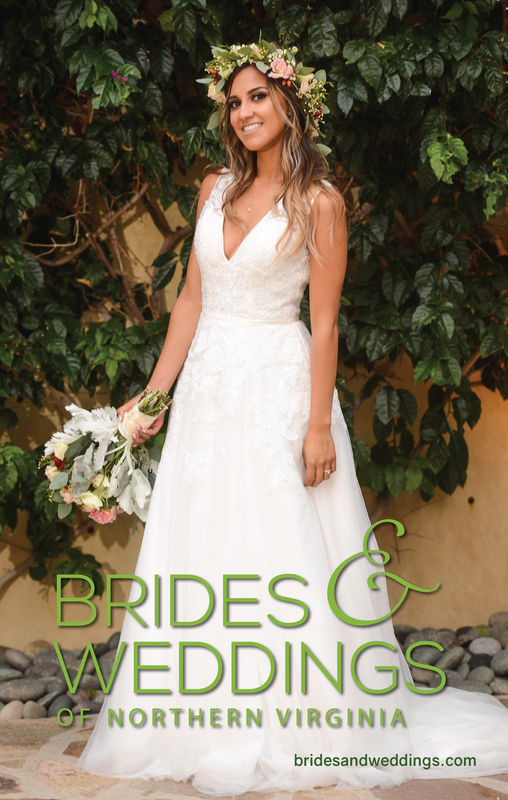 Ashlyn was gorgeous in her flowing, modified A-line gown with its lacy bodice and chapel train. 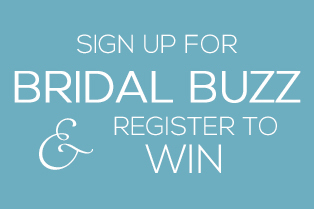 She finished her look with a fingertip veil and delicate gold and pearl earrings. Her bridesmaids wore non-matching gowns in shades of blush pink and purple and all of the ladies carried bouquets of purple flowers, greenery and baby’s breath. Ashlyn’s also featured pink roses and blue thistle. 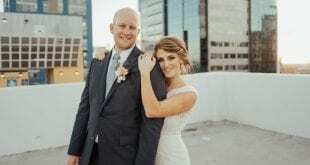 Joe was handsome in his light gray suit and deep purple bowtie and his groomsmen were dapper in dark dray with straight ties that matched the ladies’ gowns. At the reception, the pink and purple color story carried into the decor and each table featured a unique centerpiece featuring the hues. Edison lights were strung high above the space, casting a romantic glow and handmade signage and rustic details completed the styling. After a delicious buffet dinner from Robertson’s BBQ, guests had fun posing for pics in the Happy Trails Photo Booth – a funky converted camper that added to the day’s whimsical feel. As the sun set over the river, Ashlyn and Joe cut their four-tiered wedding cake before making their getaway, their guests with red and white pom poms in hand, a nod to nearby Alabama University’s school colors. Congratulations Ashlyn and Joe! 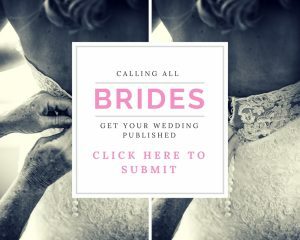 Thanks for covering our wedding! Ashlyn and I had a lot of fun doing it! 😁 We really enjoyed the article!